The small market town of Lostwithiel sits quietly beside the upper Fowey River. During recent floods the 15th-c medieval bridge seemed in danger of collapse but fortunately stood firm. Up until the 16th-c, the Fowey was navigable right up to the bridge and the remains of quays can still be seen along the river banks. The town has many fine old buildings, including several well preserved Georgian houses in Fore Street, a 15th-c grammar school in Queen Street and the Guildhall (circa 1740). The Georgian Corn Exchange and Town Gaol on Fore Street are home to the town museum. and county treasury were housed in the Old Duchy Palace in Quay Street. The 13th-c parish church of St Bartholomew has an interesting octagonal spire. The unusual octagonal lantern window, just below the spire, was added in the 14th-c. The town has plenty of shops, galleries, pubs and cafes cater to both local and the holiday trade. 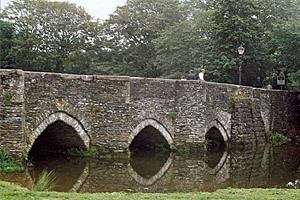 Two riverside parks provide pleasant walks and invite enjoyment of the River Fowey. There is a good selection of guest houses and hotels, in and around the town, including a fine golf and country club, which makes Lostwithiel an ideal base for exploring the south east Cornwall area. Located in the Corn Exchange, this small local and social history museum has a fascinating collection of items on display, mostly donated by the local people. There is also a small reference section containing parish records, directories and old photographs. 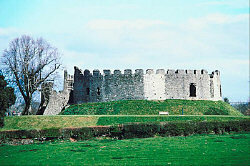 Just 1.5 miles (2 km) north of the town, the mainly 13th-c moated Restormel Castle, set high on its imposing mound, offers a trip back into history. With many fine views out across the beautiful Glynn Valley from its defenses. It was here that the Earls of Cornwall built their stronghold and it is still one of the best-preserved fortresses of its period in the West Country.